The month of August is National Breastfeeding Month and August 1-7 is World Breastfeeding Week. Both are annual celebrations of breastfeeding that encourages families, communities and the world to support breastfeeding to improve the health of mothers and babies. Using the World Alliance for Breastfeeding Action’s (WABA) 2018 World Breastfeeding Week logo and theme of Breastfeeding: Foundation of Life, the Colorado WIC Program has adapted focus points and developed materials to share with breastfeeding families (click here). The below focus points reinforce the importance and impact of breastfeeding on mom, baby, family, the community and the environment. 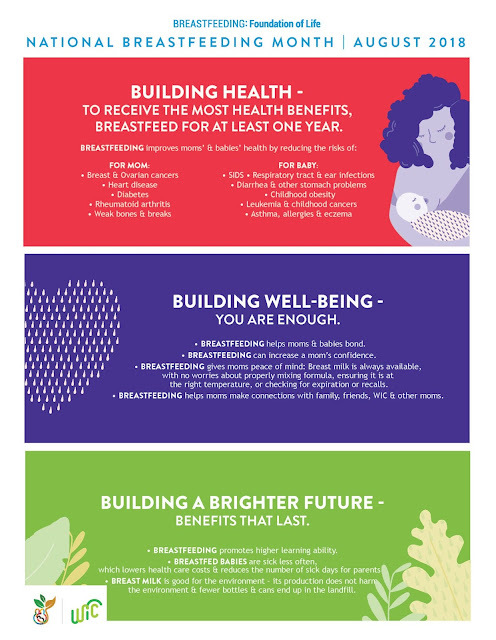 Building Health - To receive the most health benefits, breastfeed for at least one year. Building Well-Being - You are enough. Building a Brighter Future - Benefits that last. Please review and download the Action Ideas information and use materials provided in the Action Packet. Please share any of the materials to those in your community. Consider targeting 1-2 of the support areas in your community during the month of August to increase breastfeeding support for moms and families in your community! Visit www.breastfeedcolorado.com for more materials and information to spread the word! Join the nation in celebrating and promoting breastfeeding during the month of August and learn what role you can play in helping women find the support and encouragement they need to reach their breastfeeding goals!